About six hundred years ago, an idea was born. Following the Middle Ages and veiled by the Christian doctrine, the need for a new understanding of what it means to be human emerged. The idea spread from Italy, across Europe giving one of the most famous and fruitful artistic and cultural periods in history we know as Renaissance. Bringing forth the culture of ancient Greece and Roman Empire as the ideal once again, Renaissance offered a rebirth of the arts and sciences, opening the doors for free thinkers, creators, and artists to blossom. In Italy, where Renaissance first emerged, the new period was instigated by socio-economic changes as well. 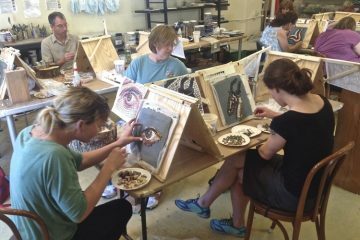 Patronage of the arts was not the privilege of the church alone anymore, but a number of wealthy families and individuals appeared as patrons of the arts. In fact, the majority of wealth was concentrated around the city of Florence and perhaps the most important family that invested a lot in art at the time was the famous Medici Family. In visual arts, Italian Renaissance introduced crucial aspects that were soon adopted worldwide – naturalism in representation, portrayal of figures from many angles, sensible proportions within a canvas, nuanced color and shadows, and perspective, while human body came into focus. Some of the most famous artists in history belong to this period, including Sandro Botticelli, Michelangelo, and Raphael, while Leonardo da Vinci, as an inventor and an international figure, is often taken as a symbol of the period. This elitist, refined and flamboyant style spread throughout Italy, to Rome and to the rest of Europe, where it gave some of the most fascinating pieces in the history of art such as Botticelli’s “Primavera”, “The Birth of Venus”, Michelangelo’s Sistine Chapel ceiling or the world-famous “Mona Lisa” painted by Leonardo da Vinci. Ever since its peak in the early 1500s, Renaissance remained one of the most influential cultural periods in Western civilization. It inspires writings and designs to this day, permeating different fields from architecture to fashion. 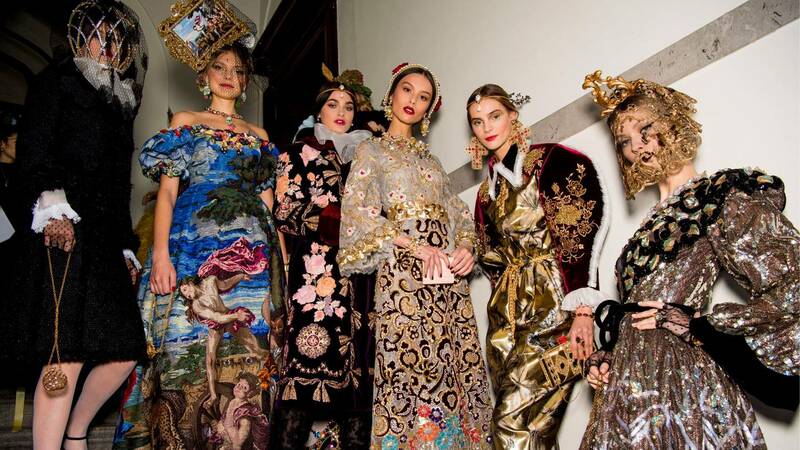 A recent Milano Fashion Week display of one-of-a-kind haute couture clothing designed by Dolce & Gabbana confirms that the Renaissance is still alive and well, whereas Italian art history is as impelling as ever with their recent fashion show Milanese Renaissance. 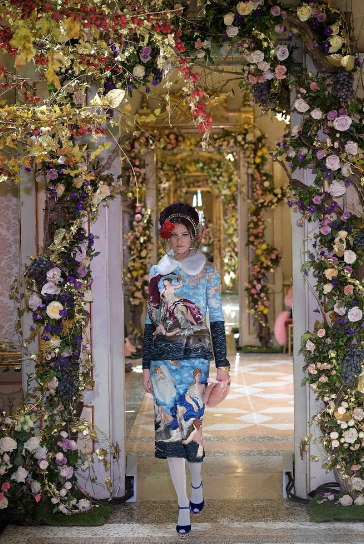 Models wore garments with different homages to Renaissance masterpieces, evoking the aesthetics and spirit of the past while bringing the bold interpretations brought bright colors to life via perfect execution. 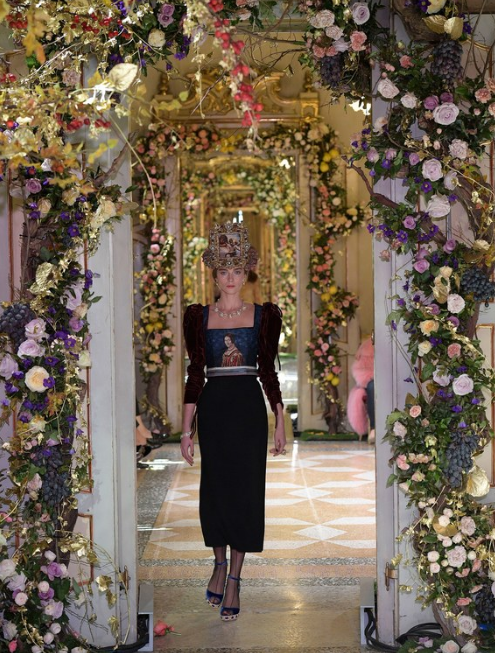 Like Vogue said, “Dolce & Gabbana attempted to reclaim control of its present by showing a collection that displayed its artistic and technical virtuosity to the full,” and to impose a new trend in the ever-so-changing fashion world. The correlation between the world of fashion and interior design can be found in this instance as well. Different Renaissance-like elements in an interior add a dose of chic, and a particular sense of opulence can be increased by placing a Renaissance-inspired mosaic in a space. 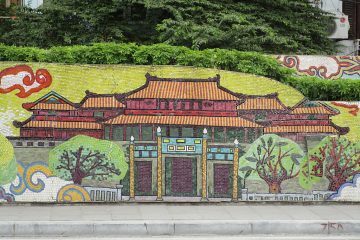 Interestingly, the famed fashion house designers have found inspiration in some of the works recreated in mosaics as well. 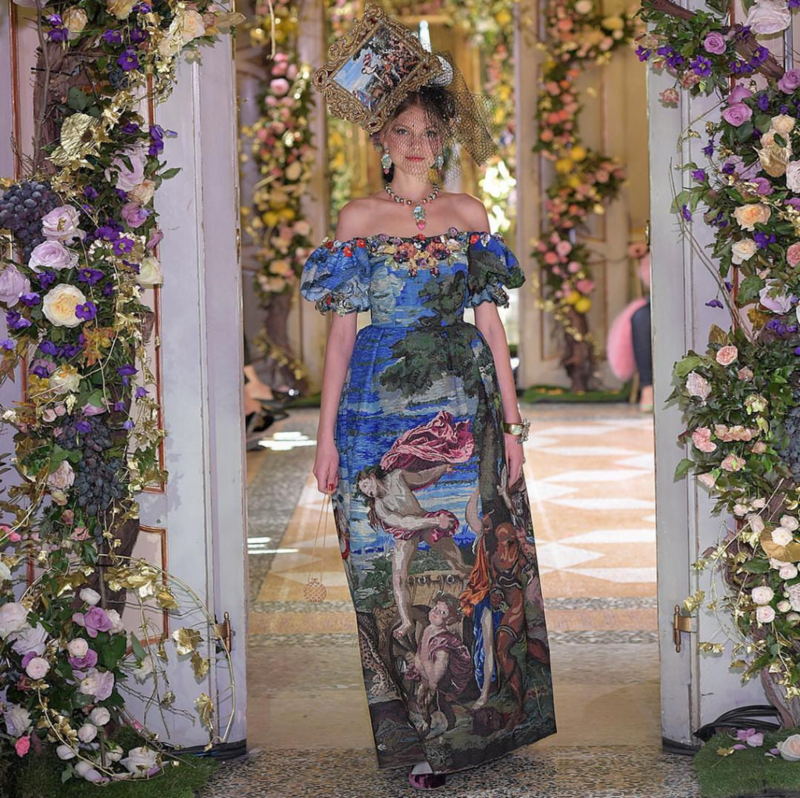 At the opening the fashion show, one of the models donned a dress featuring a detail of Titian’s “Bacchus and Ariadne” in needlepoint, wearing a headpiece with the framed image. The simplicity of the form with just a touch of frou-frou enhances the image, treating this masterpiece as a pop-culture artifact. A similar feeling is gotten viewing the Hendrick van Balen “Bacchus And Diana” mosaic reproduction, although the medium is entirely different. As much as the D&G dress emanates glamour, the mosaic piece promises a dose of luxury to an interior. The same motif is repeated in another outfit, featuring a more formal look with a skirt and a blouse. The free-spirit of the form is replaced with tight complementary pieces of a smart outfit, allowing the pattern – the Titian image – to shine. 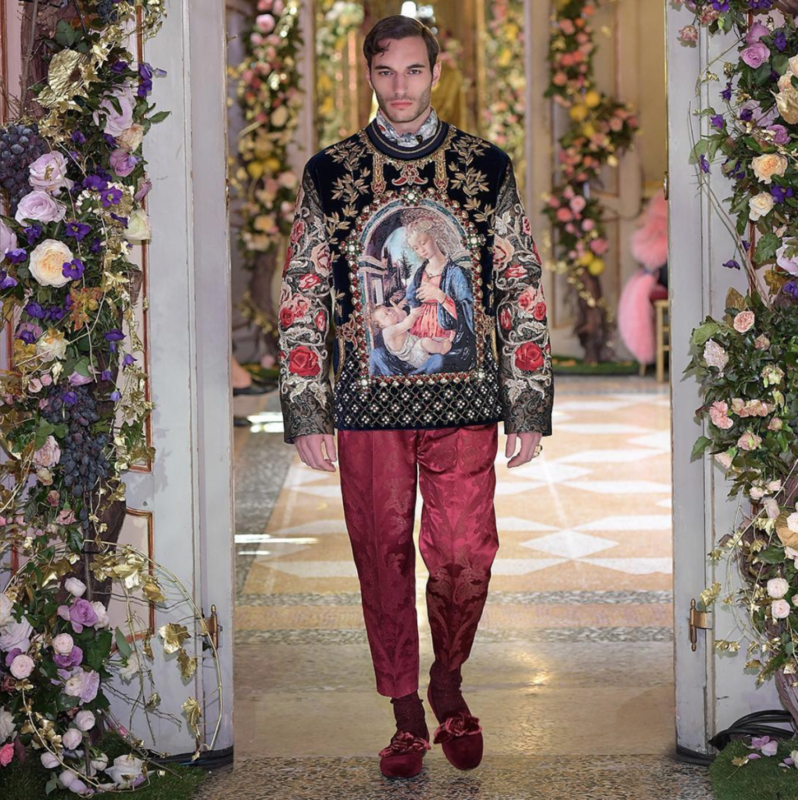 By taking some of the most iconic paintings from the Renaissance period, Dolce & Gabbana infused their designs with a particular sense of opulence, poise, but also innocence and mystery. Gliding down the runway in a gold lace dress, wearing an elaborate headpiece and an ornate necklace, the model resembled a modern princess. 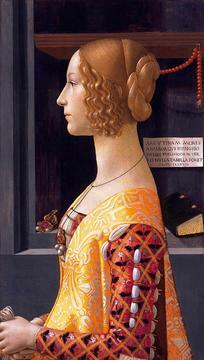 The sense of elevated feminine beauty is elevated by the cameo image on her chest showing a reproduction of Domenico Ghirlandaio’s “Portrait of Giovanna Tornabuoni”. By intertwining the Renaissance with the present-day ideal of beauty, the duo tells a story of our time reflecting upon an old mirror. A similar impression is given by a more solemn black outfit featuring the famous “La belle ferronnière” portrait attributed to Leonardo da Vinci. The mystery behind the woman on the portrait flows into the D&G model wearing their black dress with puff sleeves, honoring the inspiration and introducing a new vantage point on the 15th-century masterpiece. 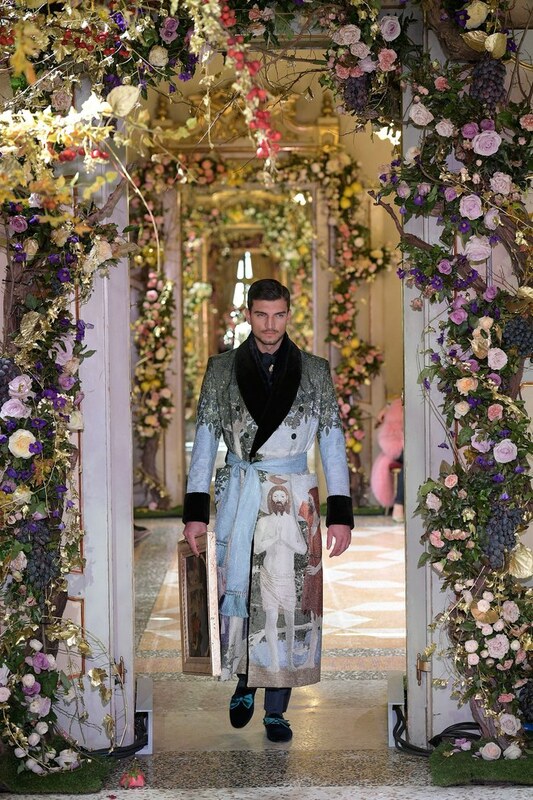 D&G presented an interesting take on the men’s house robe featuring the early Renaissance “Baptism of Christ” by Piero Della Francesca. Handmade robe gives a new meaning to luxury, promoting elegance while running a theme of water and purification at the same time. The religious scene becomes more personal here, although it is, again, immersed in a pop-cultural setting. 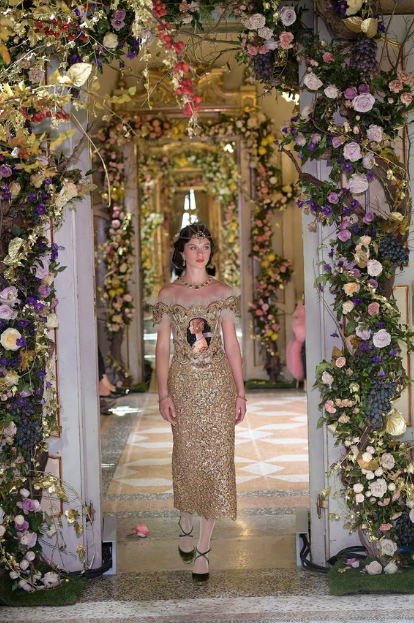 Hardly a stranger to Dolce & Gabbana universe, an image of Madonna was often used in this show. 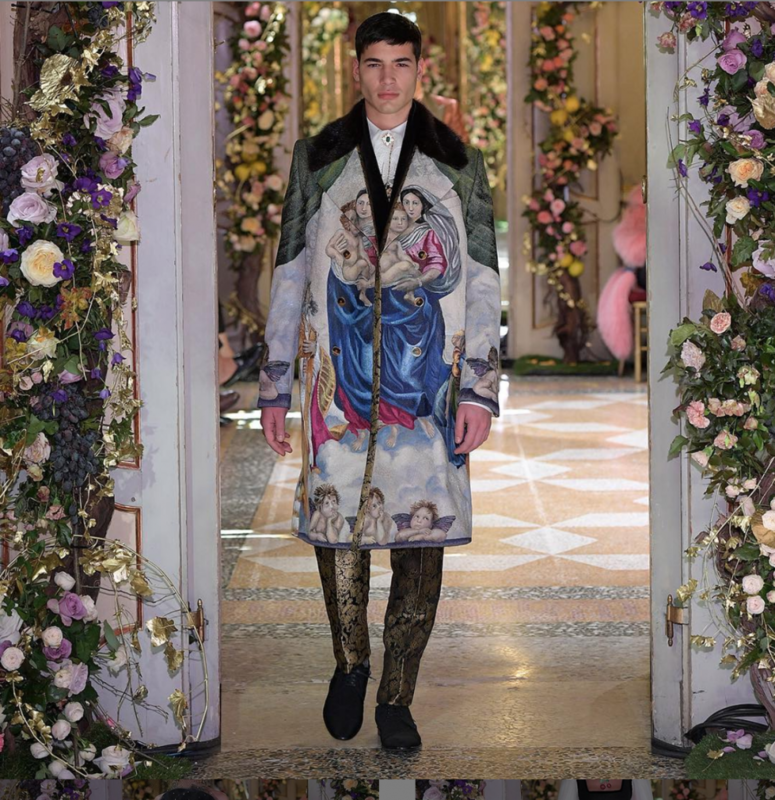 From an elaborate top depicting Botticelli’s version of Mary and child to a male coat that treats one of the most famous Raphael’s Madonnas as a pattern, we can see that the trend of religious imagery is far from over. Looking back all the way to Baz Luhrmann’s “Romeo + Juliet”, we’ve been seeing Madonna on clothing, personal items, furniture and elsewhere, rendered or reproduced to fit the context. Similarly to the world D&G Catholicism, the world of mosaics is particularly prone to maintaining the tradition of religious and opulent imagery. 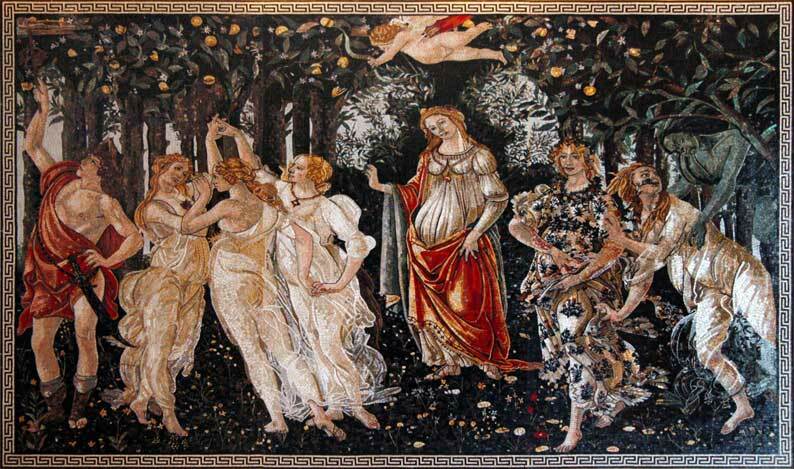 Whether it is a reproduction of Sandro Botticelli’s allegory, or a completely different take on Raphael’s masterpiece, a timelessly trendy piece of mosaic art can bring the spirit of a Renaissance art fashion show into a home. Just imagine having a detail from the Sistine Chapel, an elaborate mythological scene, or a full-on mosaic reproduction of the grand image that used to adorn papal chambers in the 16th century on your own wall. Lavish, indeed! 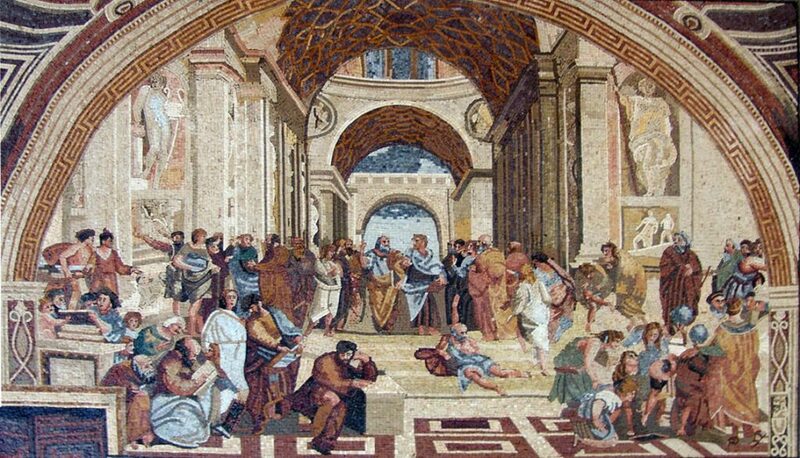 For more renaissance inspired mosaic art, check out these artworks.